Guess what? Third time's a charm when it comes to the Chocolate Candy Shop blizzard which is assorted mini chocolates blended with dark, decadent cocoa fudge and creamy vanilla soft serve. The first time I tried to pick one up, the delivery truck was "messed up" because of the holiday. On the second try, they ran out of candy bits over the weekend because apparently everyone wanted to "'Leap into the unknown". 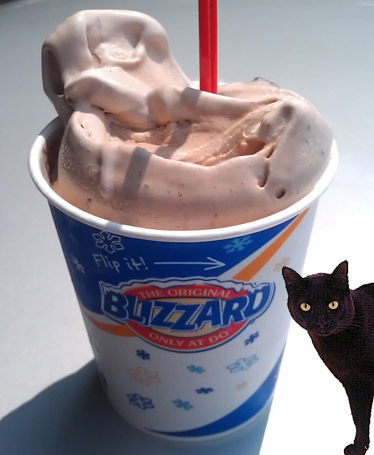 And then, finally on this fine Friday the 13th, I got my hands on this new blizzard for lunch. Mmmmm, I do love my blizzard lunches. Oh boy, new cup design! That's good because I was kind of getting sick of the old cups, it seems like they haven't changed them in forever. I know it doesn't effect the taste... or does it? After looking at my treat basking in the warm summer sun, are you wondering if I decided to go with chocolate softserve instead of vanilla? Well, I didn't actually. The "dark, decadent, cocoa fudge" has been almost completely blended with my quickly melting softserve. 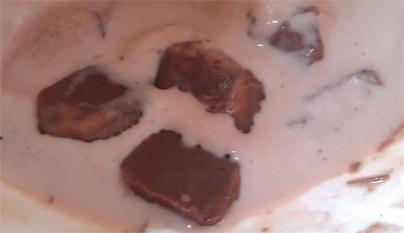 I kept scooping up the little hazelnut cubes over and over again and this is a definite plus. They're tasty and have magically held up through the blending process. ...these at the bottom. A whole bunch of them actually. 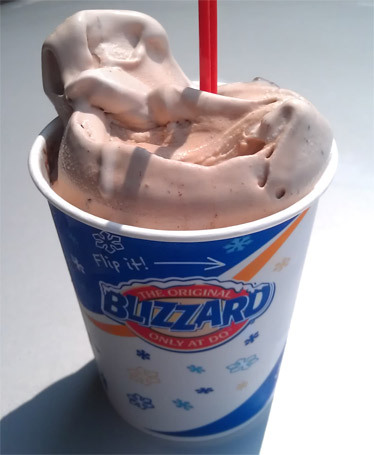 For the most part the top of the blizzard was tiny chocolate bits, hazelnut cremes and softserve. 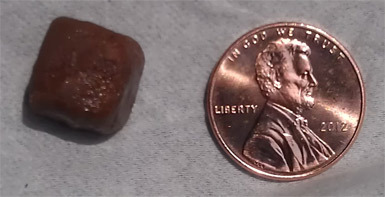 It wasn't until the very bottom that I found these big chunks of something - the picture makes them look like caramels I guess... actually they look like some kind of funky peanut butter cup bits. Ok, I know I'm a being a little random with the pictures here, but what I'm trying to visually drive at is the fact that this is a respectable new blizzard. It's not earth shattering like a nutter butter blizzard, but it's got a nice middle of the road chocolate flavor, chunks that are fun to bite, and then you are left with a very pleasant hazelnut aftertaste. I really felt like I had just finished a nice cold box of truffles when I was done. What more could I ask for? I wasn't all that impressed by this one. It was okay, I guess, but definitely not something that I would actively seek out. The filled chocolates were interesting though, so I'll give them that. I just had this blizzard and I loved how the tiny chocoltes stayed intact. I could actually taste the 3 different kinds of chocolates which I thought was neat and very interesting. All in all a little different, still very familiar, and definatly delish!